Let’s agree that the necessity of teaching kids to survive a possible shooting is all wrong and crazy. It needs to be fixed on a global level. No parent (including myself) wants to hear, think, or talk about teaching kids this area of safety. But, if we can increase kids’ chances of survival, the stress of having these conversations is totally worth it. There is no one proven method to get out of this situation. 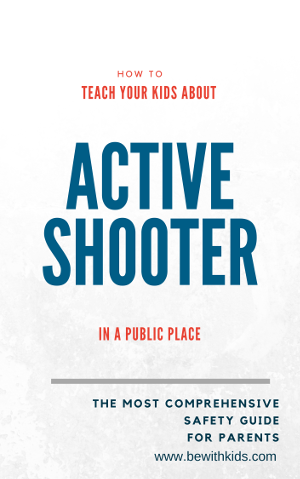 Shooting usually lasts less than 5-10 minutes – kids need to survive this amount of time. They are on their own for that time until help arrives and need to commit to rescuing themselves – they should listen to their teachers, but keep in mind that they may not be able to help everyone. If your kids are young (3-5 years old) you can just play games (see Practices below) and do not have any conversations until they can handle them. If your kids are older (5-10 years old) you can gently start the conversation about what has helped people survive a shooting. It’s easier to have these conversations outside and while walking. Keep them under 3-5 minutes. Stop if you feel anxiety, fear, or resistance. Never force your child to talk about anything if he is not ready. Leave the door open – tell your child he can always come to you with any question no matter how scary or weird it may seem – you are an adult and you can handle it. Keep answers to a level kids can accept. If you are not sure you can be calm talking about it for the first time – show kids a video with a safety lesson by an elementary school teacher – it is listed in the resources at the end of this article. Apart from having conversations, kids need to practice and reinforce the skills. Safety is like swimming – you can’t teach it by just talking and watching videos. Even though many schools do drills, it’s your responsibility as a parent to make sure your child understands and remembers what to do. The faster people evacuate the higher their chances for survival. In situations of stress, people may freeze and waste crucial time not believing the shooting is real. This brain inertia is called “normalcy bias”. It happens when the brain refuses to accept the danger and underestimates the possible effects. The brain believes that things will always function the way things normally have functioned. The faster people react, the higher the chances of running away. This is one of the main reasons we need to have these conversations with our kids despite all the drawbacks of stress and anxiety. If kids are at school, they will most likely be alerted by their teacher or by the intercom systems. In all other places kids need to be able to figure it out by themselves or follow the instructions of their trusted adult. This includes knowing how guns sound and look. Recognize shooting by sound: Take kids to a kid-friendly place where they can hear real gun sounds in a safe environment. In real life, the sound is different from the movies. Use ear protection. Military and history museums have open house days and do pretend battles. These guns may be old models, but they are still guns. If you or someone you know own guns (and your kids are old enough) you can take them to a place where you practice and let them hear the sounds. It should be an age-appropriate and kid safe place. Military or history museums often have modern guns on display. Your police department may do field trips for kids and have a museum or an exhibition. Show your guns if you have them. Follow safety rules. A gun store or a hunt are not appropriate places for kids to have safety lessons. Running from the building towards a safe location is the first option that should be considered. Pay attention to the layouts of buildings, location of the stairs, corridors, hallways, emergency exits, windows, and mark them as possible evacuation routes. + Note the objects that can be used as covers (walls, columns, vending machines). Shooting a moving target is harder than someone who is still. If you can, hide behind the objects - put objects between you and the shooter. Practice 5: Take kids to a laser tag, Nerf gun place, squirt guns, or paintball obstacle course so that they can practice running and hiding. Practice 6: Teach kids to run fast by signing them up for soccer, baseball, or athletic training. If evacuation is not possible, the next option is to hide. An active shooter is less likely to force his way through locked doors than trying to find easier targets. On this step, your goal is to teach kids to hide and never open the doors to anyone for any reason (shooters may pretend to be asking for help or shelter in the room). Remind kids that everyone must be quiet, all phones must be in silence mode, lights off, blinds shut. Call 911 – don’t assume someone already did. Practice 7: Play classic hide and seek when kids play with each other or you. Discuss with kids that most of these places are inappropriate and dangerous for regular hide and seek. Never let kids hide there during play. These are the places for hiding in case of a shooting emergency only. Make sure kids know how to get out of those places and can do it without help. Squeezing yourself into a tight or tiny space - a shelf under a desk, a locker, or between the pieces of furniture. Teach kids to stay in one position at the same place for 10-15 minutes without moving or making a sound. Set a timer for one minute and tell your child to hide in some regular hide and seek place and stay there until the timer goes off. Each round, increase the time minute by minute until kids can stay unnoticeable for 10-15 minutes while you are looking for them. Make sure kids don't respond to conversation prompts (shooters may knock on doors or pretend to yell for help). 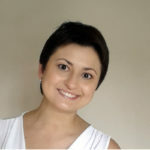 By blocking it – using the furniture (desks, podiums, bookcases, shelves) or other heavy objects (bins, containers, boxes.) Try different layouts - putting the heaviest object first to the door or last to the door and checking which version works better. By fixing the opening mechanisms: if you have a belt, loop and tighten it around the top part of the door closer - so that the arms can’t move. You can also tighten it around a door handle and attach it to something sturdy if it’s possible or hold it in your hands (standing by the side of the door avoiding the line of fire). This is the last resort – teach kids to never play a superhero. Many kids believe they can fight a gunman. Fighting is the last option. It may be used only if the other options are not available or failed to be executed (if the room has no place to hide, if the door cannot be locked or barricaded, or if the door was forced open). Little kids are not supposed to fight a shooter. But kids need to know that an adult may fight with a shooter and they should stay as far they can - running away if possible - because the direction of the shots becomes unpredictable. Older kids also need to know that as a last resort they may attack as a class throwing things, yelling, screaming, and keep running. Watch video 3 under this article. You are most likely to have something to protect yourself in your classroom already. Prepare yourself mentally to fight. Stay out of the line of the fire. Attack from the side of the door. Attack from different angles if you can involve several people. Make as much noise as you can to help other people know where the shooter is. In this scenario, your biggest asset is unpredictability, focused aggression, and full force action. The weakest places of the shooter are his vision and the trigger of the gun. Fire extinguisher to hit or spray. Spray bottles with bleach, toilet cleaner, or cosmetics aerosol to spray. Scissors, tactical or regular pen to poke. Rice, beads, and sand from sensory tables to distract. Chairs, books, backpacks, binders, laptops, flag poles, tabletop lamps, staplers, plant pots, coffee pots, skateboards, water bottles, stoves, microwaves, even phones for throwing and hitting. A belt can turn into a choking weapon. A trash can put on someone's head may give a couple of seconds as well. 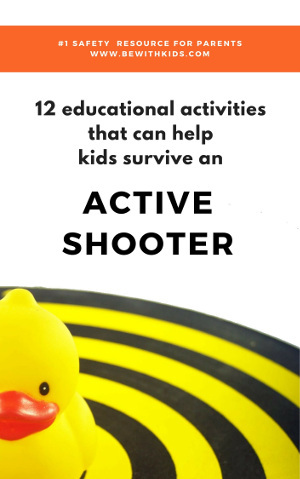 "12 educational activities for kids that can help survive an active shooter situation"
A must-have resource that nobody wants, but everybody needs. Be prepared if nothing else. Hopefully, none of us will ever need to implement any of these tips. If you’ve gotten to the end of this uneasy article – you are an amazing parent! Please, scroll to the comments and let us know what you think about this article. A lesson presented by an elementary teacher – she is talking to her class - there are no scary scenes in it. This video demonstrates a lesson on what teachers are supposed to do during a lockdown. Thank you Katy! I was going to ask you if you could discuss teaching kids about active shooters. We had a lockdown at our local high school this week due to a threat from a student who was known to have access to guns at home. Thankfully another student reported the threats and no one was hurt. It just hit way too close to home. I shared this to all of my mom groups on facebook. Oh, I know what you are talking about. This is so sad that we need to teach our kids this topic. Thankfully, this case has been prevented. 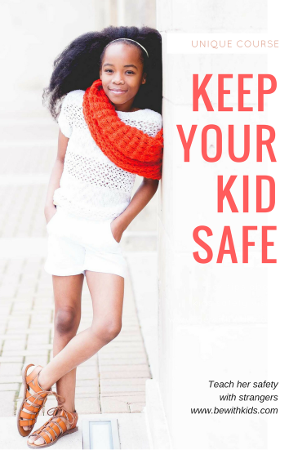 The more we teach kids safety, the more of them will know what to do to prevent things from happening: “If you see something, say something”. Thank you for sharing!